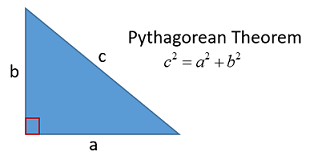 Pythagorean theorem is a well-known geometric theorem where the sum of the squares of two sides of a right angle is equal to the square of the hypotenuse. The Pythagorean theorem has a long association with a Greek mathematician-philosopher Pythagoras and it is quite older than you may think of. With the deep understanding of the theorem, you can solve complex geometrical problems with satisfactory answers. The whole credit for the discovery of theorem goes to Pythagoras in India. This is really surprising that concept was proposed almost 4000 years back and there are more than 400 proofs for the same that was given by the Greek mathematician Pythagoras. There are a few people who argue that the concept was invented during 500 B.C. before the proposal of Greek mathematician Pythagoras. They are also helping to solve the hypotenuse of an isosceles triangle to compute the approximate up to five decimals. As shown in the image above, Pythagoras theorem states that the sum of the squares of two sides of a right angle is equal to the square of the hypotenuse. Where c would always be the hypotenuse. This is a fundamental theorem in mathematics that explain the relationship among three sides of a right-angled triangle. Till the time, we have studied the basic concept of the Pythagorean theorem. Here we will check on Pythagoras formula and its applications. A right-angled triangle is a triangle whose one side is angled at 90-degree and its opposite side is known as the hypotenuse. The other two adjacent sides of the triangle are perpendicular and the base. It is used for a plenty of applications in the real life like it is used to check either the given triangle is a right-angled or not. It is used in aerospace science and it is used by the meteorologists to compute the range or sound source with the help of Pythagoras theorem. Further, it can be optimized by oceanographers to check the speed of sound inside water. Where c is always the hypotenuse and don’t forget to compute the square root in the last step. Till the time we have discussed on hypotenuse only i.e. c. The other two sides are perpendicular (a) and the base (b) and Pythagoras rules are applicable to right-angled triangle only. Question 1: Find the hypotenuse of a triangle whose lengths of two sides are 4 cm and 10cm.